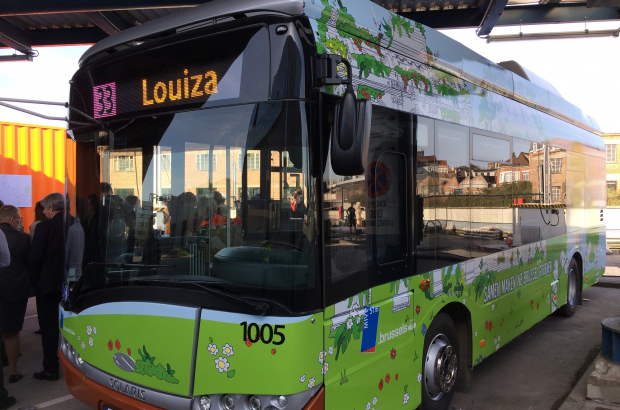 A new bus line launched earlier this month that connects two of Brussels-City’s most crucial neighbourhoods – the upper and lower parts of downtown. Line 33 links Louise to Dansaert, via several key stops, including the Sablon, Grand’Place and Saint-Gery. It is a line that should prove particularly popular for tourists, shoppers and entertainment-seekers, coming within a few steps of Central Station, Manneken-Pis and Ancienne Belgique. If that sounds suspect because of the narrow streets involved and the proximity to the pedestrian zone, there’s a reason: The buses of line 33 were specifically manufactured in a smaller size to manoeuvre the tightest corners. And every single one of them is electric. It’s the first bus line in Brussels to be fully electric. Public transport authority Stib refers to them as Citybuses, and it ordered seven of them made to measure from the Polish manufacturer Solaris. The buses have space for 22 seated and 20 standing and run every 20 minutes. They are charged overnight and can run an entire day without needing to be recharged. Drivers have been specially trained to operate the Citybuses. Being electric, Citybuses are also much quieter than normal petrol-fuelled buses so as not to cause noise nuisance for residents living downtown. They also, of course, emit no exhaust fumes. There are a few standard-size electric buses on other Stib lines, and the authority has ordered an additional 90 electric hybrid buses – this time from Volvo – to add to other lines in the over the coming year. It has also ordered 25 articulated hybrid buses, with a call for bids out for 145 more.